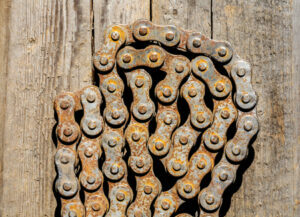 Chains are essential drive train components on most bicycles, but they’re not without their faults. Chains inevitably wear out over time, for example, and they can leave unsightly grease stains on pant legs if you’re not careful. If you’re tired of servicing the chain on your bicycle, you’ll be happy to know that a Danish company called CeramicSpeed has been hard at work building a bike that doesn’t use a chain in its drive train. Instead, it uses a carbon-fiber driveshaft to transfer torque from the pedals to 13-speed rear cog on the back wheel. CeramicSpeed teamed up with the mechanical engineering department at the University of Colorado to design a durable drive shaft that could replace the chain on its latest bike. The concept is called “Driven,” and it was developed in an effort make bikes more efficient and reliable. The drive shaft connects to the rear cog via 21 ceramic bearings that generate far less friction than conventional chains and derailleurs. According to CeramicSpeed CTO Jason Smith, this design allowed the company to achieve a “99 percent efficient multi-speed drivetrain” that relies on fewer moving parts than a traditional chain-driven bicycle. The CeramicSpeed design—which looks every bit as impressive as it performs—is not yet widely available, but it did recently win a Eurobike Award at the annual tradeshow in Germany. Before too long, you could see one of these innovative chainless bicycles coming to a bike store near you.